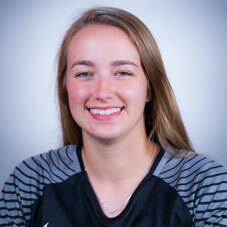 Appeared in only two matches in the net, logging just over four minutes of play … Held a scoreless four minutes in the regular-season finale against No. 19 Tennessee (Oct. 26) … Was the keeper on penalties that helped Arkansas advance through the SEC Tournament semifinals against Vanderbilt (Nov. 2), making one save. Did not appear in any games for the Golden Gophers. Graduate of Holy Trinity Catholic Secondary School … Honor roll student … Coached by Joey Van Loon and Elizabeth Spagnolo … Cornwall Lions Club athlete of the year … Also trains with Golden Gloves Academy … Member of Ottawa South United in the Ontario Youth Soccer League, coached by Dominic Oliveri … Ontario Cup Finalist … ERSL Champion … EOSSA Champion … Ottawa Showcase Champion … Trains with Gibbs Training System. Daughter of David and Kimberly Beitz … Has three siblings (Melissa, Peter, Landon) … Enjoys playing soccer, basketball, volleyball, badminton, track and field, spending time with family and friends.